This week Australians and others around the world will remember the carnage that was the two world wars of the 20th century and subsequent conflicts in Korea and Vietnam which took the lives of so many. Yet there are many aspects of these cataclysmic events that are almost completely forgotten and have no part the tale we tell about ourselves. Over the weekend, the Age carried a story about Normie Rowe and the other musicians and show business folks who went to Vietnam to entertain the troops, but another group of non-combatants has never been recognised. 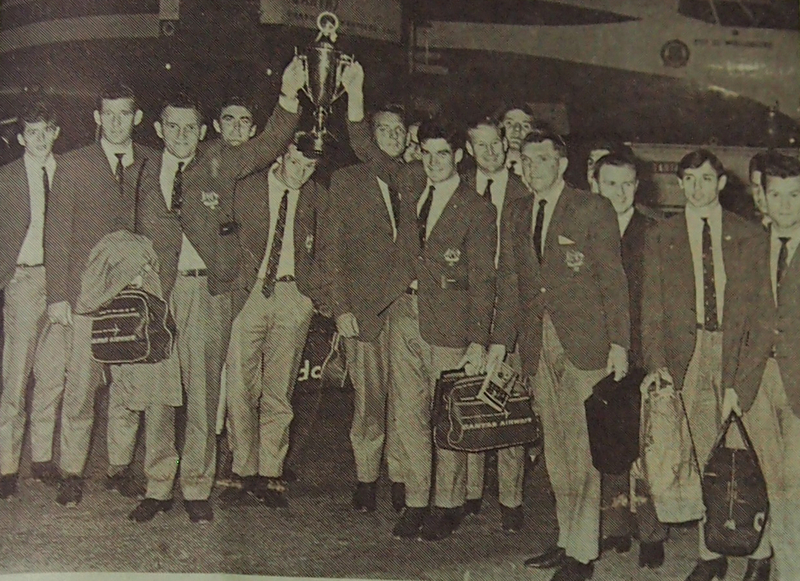 In mid-1967 the government of Harold Holt decided it would be a good idea for the Australian football team, not yet called Socceroos, to go to Saigon to take part in the Independence Day tournament to lift the morale of troops and nations taking part. As Ray Richards who took part said later, ‘It was pure propaganda, we went into the middle of a war zone, to boost the morale of the troops’. The late Johnny Warren remembered the team would be eating with soldiers in their mess and then going to play football, while their colleagues went off to fight. Players were warned by security on arrival not to spend time with Americans, because the latter were prime targets for the Viet Cong. When they were taken on a bus tour of the grounds they were to play on they saw strange objects on the pitch and were told that these were mine detectors. From their hotel they could hear blasts going off and a car was blown up nearby. They were told not to go near an isolated unattended bicycle because it might be booby-trapped with explosives in the frame. The big guns could be heard firing virtually all through the night as the players tried to sleep. Ray Richards dousing himself with water after coming off injured and exhausted. Lou Lazzari, Australia’s masseur to his right. Source: Laurie Schwab collection, Deakin University Library. Security was tight. Ray Richards remembers, ‘We went to the Australian Army barracks, they called it the Canberra. It was just a big concrete building with table tennis and pool tables and we had hamburgers and beer. We also went to the American building and had New York steaks. Outside the Canberra there were these sandbagged bunkers with two soldiers with rifles. They had whistles and if anyone stopped in the street outside they would blow the whistle. If the person did not move they could fire a warning shot over their head. If they still did not move then they could open fire at them’. Up to his ears in glaur. 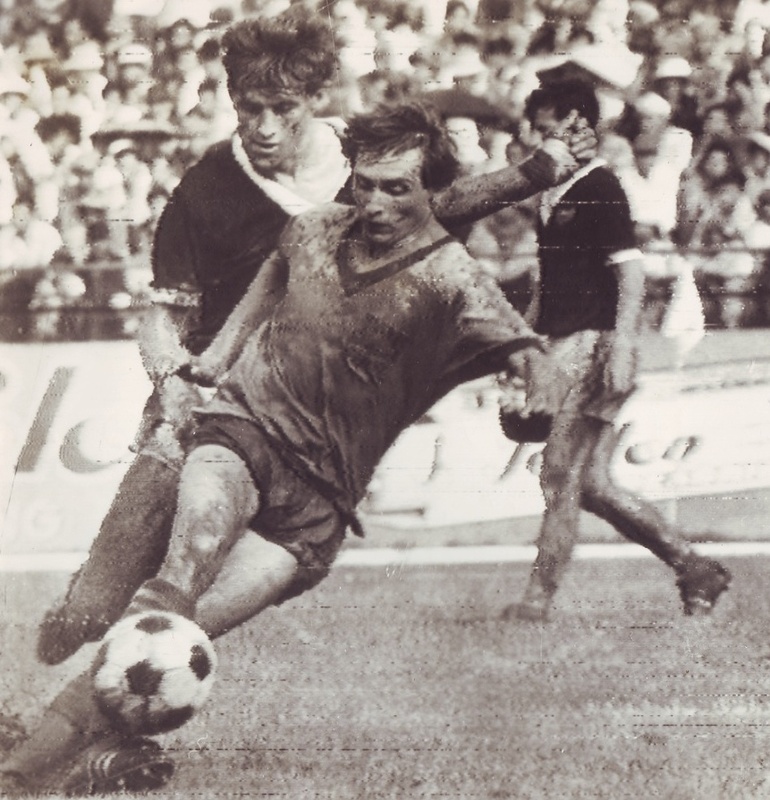 Billy Vojtek is covered in mud as he breaks away from the New Zealand defence in the opening match. Source: Laurie Schwab collection, Deakin University Library. Gary Wilkins was one of the youngest members of the squad, taken along for the experience and with an eye to the future. He nearly witnessed the first casualty of the tour. 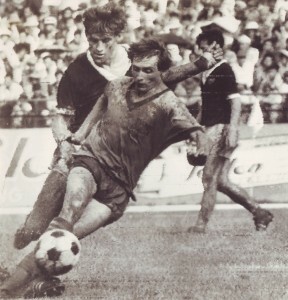 Gary roomed with Stan Ackerley, a senior defender and the only player who played every minute of every game on the tour. Stan was given to wearing new boots in the shower to help soften them and mould them to his feet. It was when he came out of the shower and tried to turn on the fan because of the humidity that he received the shock that threw him across the room. 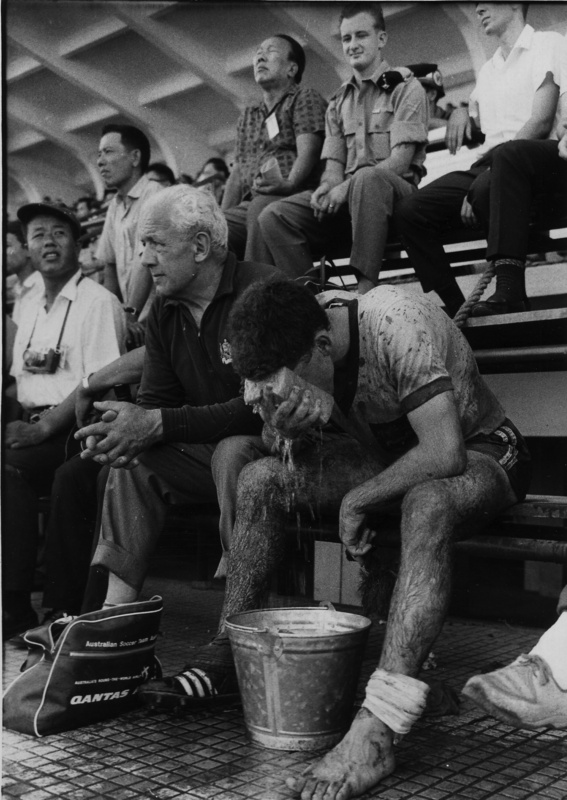 Gary thought instantly that he might be dead but rushed off to find Dr Brian Corrigan, the team doctor, who arrived and got Stan back on his feet. 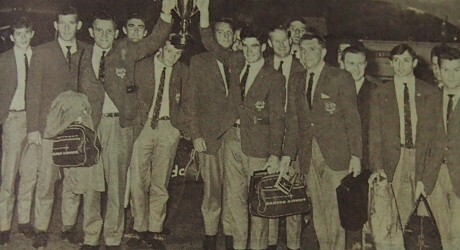 Australia won the tournament, beating South Korea in the final, thus winning the first international trophy for football. The final nearly did not take place when the Australian troops who had been supporting the team were not allowed in. The team refused to play until the decision was reversed and the locals supported the Australians against the Koreans. The journalist Hugh Lunn who was at the final said then and now that there were lots of Viet Cong present enjoying the game, so there were no guns firing during the match. John Barclay, one of the tour managers, told the team he had put his head on the block for them. He overturned an Australian Soccer Federation decision that the team should return their official track suits at the conclusion of the tour. 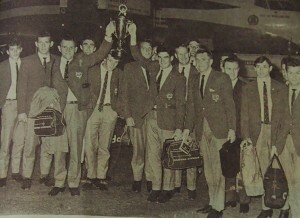 The Australian team return with the trophy from the Independence Day tournament in Vietnam. Source: Soccer World, 1 December 1967, p. 1. All those who took part in the 1967 and subsequent wartime tours in 1970 and 1972, were part-time players, reliant on employment or making their own living. Several players had to turn down invitations to play because they could not gain time off from employers or would have seen their hard won businesses collapse in their absence. Yet the team spirit forged on these tours helped Australia qualify for the World Cup for the first time in 1974. ‘They talk about bonding exercises now and rugby league players went horse riding recently but we went to war zones, much like Afghanistan or Iraq are now’, said Ray Richards. It would have taken a miracle for Australia’s triumph in Vietnam to become a part of the national sporting narrative, far less the national narrative. The death of Harold Holt on 17 December 1967 and its aftermath occupied public attention. The anti-Vietnam War movement, the failure to qualify for the World Cup in 1970, the involvement with Oceania, the opposition of the Asian Football Confederation to Australia’s membership, the rise of Gough Whitlam and Labor with a different story, all played a part. The game did not promote itself or its triumphs effectively in the aftermath of the victory in Vietnam in 1967. But that is no reason why the Australians of 1967 should be forgotten and unrecognised today. They deserve public acclaim for what they did, when they did it and the circumstances they faced. They were not servicemen, they did not face the kinds of battle that young Australian infantry went through and they have never claimed that their experience matched that of the service men and women they met in Vietnam. But they are a part of the national story.